I thought I’d post this up as a little known band in a little used venue. I known that The High played and suspect maybe The Mock Turtles did too – I saw them a few times around this time. 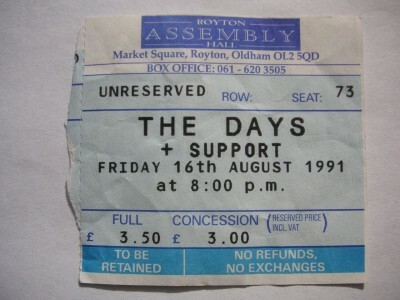 I recall they had an enthusiastic, riff-tastic guitar/vox frontman and obviously liked them enough to go to this headlining gig and to buy their 12” single – which I can’t quite lay my hands on today. Royton Assembly Halls also hosted gigs from Curve and Mock Turtles around this time. The festival at Hopwood Hall was a Heineken sponsored gig, I think Carol Wright was the promoter who used to run the Hurricane Club in Oldham for a while and with Heineken put some gigs on at the Uni-Bar in Manchester.